I'm vibrantly aware that our trip to Paris was five months ago. Call it summer stupor...fickle frenzy, lazy luster. 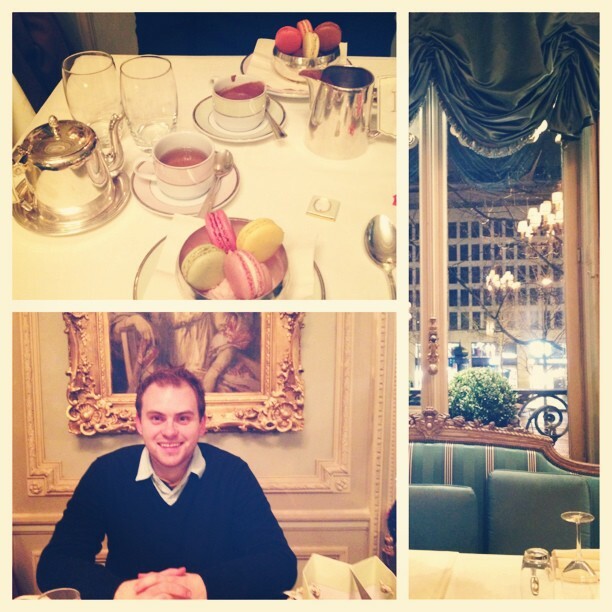 I have completely neglected to blog about our very last day in the city of lights! This comes at a painful time because both Dusty and I have been bitten rather aggressively by the travel bug. Wanderlust is stirring within us and we feel uncomfortable sitting at a desk all day. I suppose this will have to do! 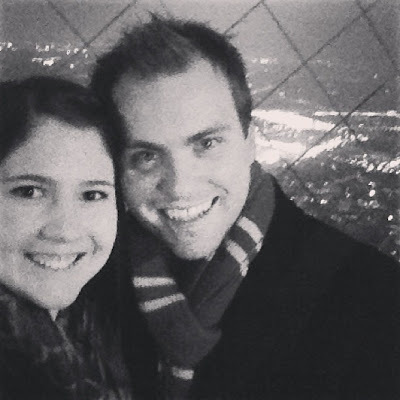 Blogging about one of the most beautiful adventures of our lives. Cheers to many, many more - and the sooner the better! Day 5 dawned bright and early, as we wanted to drink up every last bit of Paris. We were planning on going to Versailles for most of the day, so we got ready and headed down the street to a little bakery we had seen earlier to grab some pastries to go. We settled on a croissant and a chocolate croissant, both delightful in their buttery flakiness. I'm alright with being a flaky person, as long as it's in reference to the leftover bread crumbs on my coat. Before long we were hopping on the train to Versailles. It was around a half hour trip, so we just sat back and enjoyed the cloudy day and the city sights. It was very, very cold and windy. The sky was overcast, and our legs were aching from such a rigorous week of travel. Versailles is a royal chateau that sits as a symbol of the absolute monarchy of the French political system in the time it was built and inhabited. It's gorgeous and ornate, overwhelmingly so - room by room a shining, stampeding example of the vast wealth and extravagance of French royalty. Naturally all I wanted to do was live there. As you can see from the pictures above, we had stopped at a Starbucks as soon as we got off the train. Luckily for us, there was the infamous "American hub" combo of a Starbucks and a McDonald's right next to the train station. 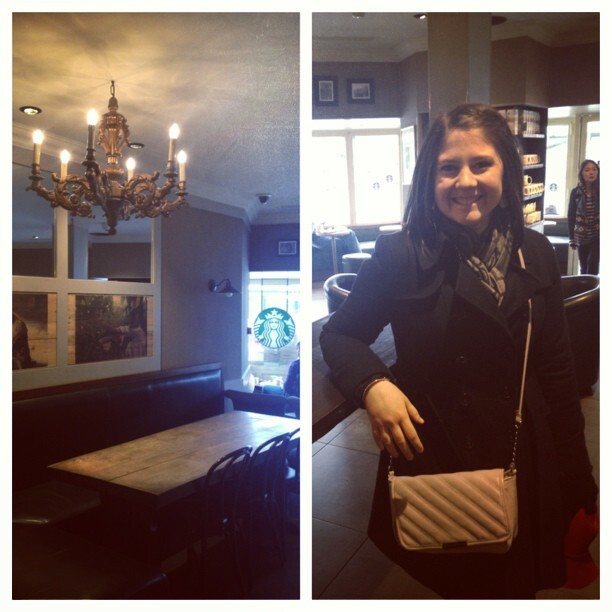 It was a rather fancy Starbucks, which I enjoyed immensely. We were unsure where to start once we entered those first few sets of Versaille's golden gates. We decided to check out the gardens before heading inside! I can't really articulate how insanely massive this property was. It went on, and on, and on. There were properties within properties, mazes and gardens and chateaus and little villages. It was intimidating, to say the least! This photo below doesn't even do it justice. 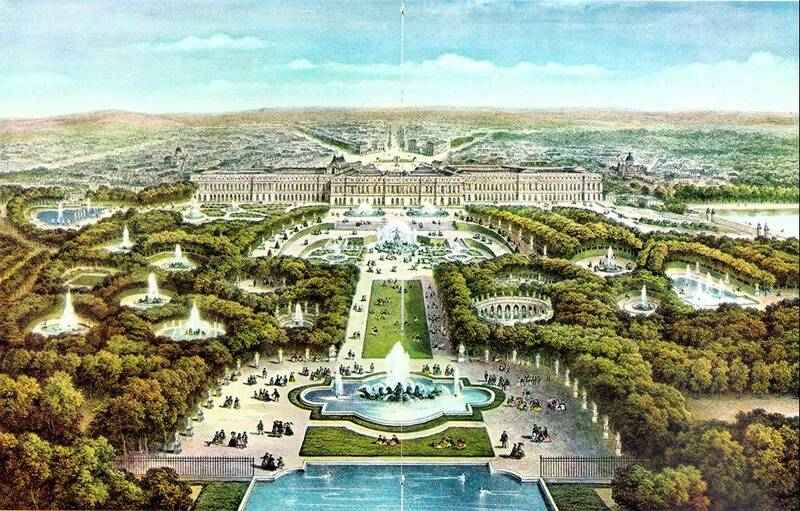 This doesn't even include Marie Antoinette's summer home, and a few other key tourist spots along the way. Needless to say, we were quite overwhelmed. The only real downside to all of this (aside from the walking on our already-swollen feet all day) was that we were there in the leftover winter months, so the gardens weren't actually in bloom - in fact, most of the statues were covered up because of the snow and they were doing maintenance on a lot of the fountains. This made for an eery, often abandoned feeling to our walking adventures, and it wasn't as pretty as we had envisioned. We kept walking and walking until we came to an enormous lake-like fountain that looked pretty awesome in all its glory. As you can see, it wasn't what we'd consider a crowded day. Oftentimes we'd look around and realize we were the only ones for (what felt like) miles. It was odd not having the normal restaurants or carts or little stops that we had come to expect from our time in Paris. We quickly began to realize that hardly anything was open, and we were traveling around this huge expanse of land with no idea what we were doing, with no food and no more coffee. The further we went, the more strange it felt, like we were trespassing on history. There was an eery sort of silence all over the grounds. Eventually we came to The Grand Trianon, which was built as a retreat for the King. We toured the inside and I quickly became enamored with all of the Marie Antoinette themed gifts in the gift shop. 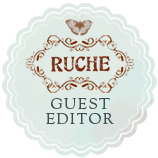 I became really interested in the themes for each room, especially the matching upholstery. It's so detailed and colorful! My idyllic scene of my future self drinking sweet tea on my back porch (yes, Arizonans can have that dream too) is a little more simple-minded than this, but I could totally adjust. See? Check out that upholstery, amiright? Obviously one of the biggest things that sets this structure apart is the incredible red marble. Which basically makes it look like a fabulous pink castle. Next, we wandered leisurely over to Marie Antoinette's summer home, a gift from the king. How kind. Honey, I want a summer home. Oh, and also, it has to have a medieval style tunnel or else no dice. I love the central staircase. I especially loved the windows with little golden-scrolled balconies. Indoor windows are super fancy. Indoor balconies are downright extravagant. Honestly, I will hereby reject every chandelier that is not affixed to the ceiling by a giant fabric flower bow. 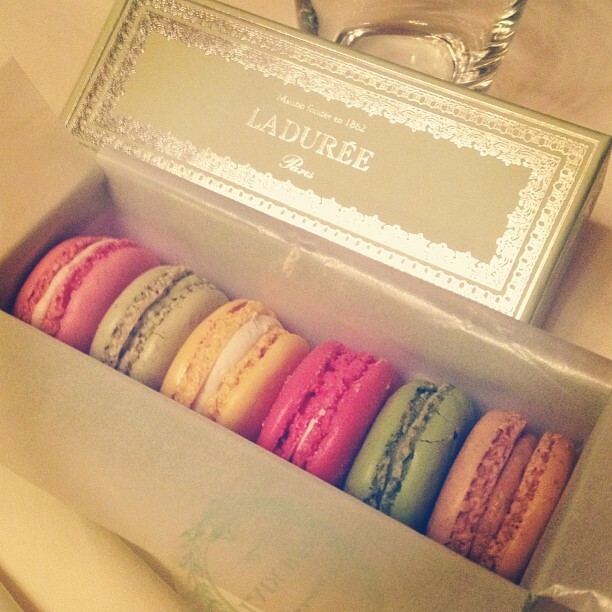 Marie Antoinette was no fool. She knew that the key to beauty and a lifetime of happiness was a room with natural light and humongous mirrors. So naturally, she had a room with vanishing walls. Pull the crank, and the humongous mirrors would slowly disappear to a room downstairs, to reveal the giant windows behind them. A room full of sunshine, or a room full of your own reflection. Win-win. We realized around this time that we were absolutely starving. Because of the unlikely existence of a magical gazebo troll who sold crepes and coffee over yonder, we decided to keep going and hope for civilization. As we walked, we barely saw another soul for miles. What we did see were stretches of dark soil, sprinkled with snow. We became so deliriously hungry that we started referring to them as brownie fields. Before too long we came upon the Queen's Hamlet. Although I could hear was, "There goes the baker with his tray like always..."
(Another symptom of hunger: Disney characters singing about baked goods in my head). It was a delightful little place, and I just wished it was actually inhabited. By bakers. I can only assume someone eventually comes out to care for these animals, although we only saw two or three other people, and they were tourists like us. It was a ghost town of magical history and possibility. And sheep. We finally found our way back to the palace of Versailles, although the walk back was a total blur. We stumbled into a little cafe outside the palace, the kind of place made for tourists. Expensive and not very good. But we didn't care much. 7 euro for a Coke? Gimme. We just propped our feet up and ate forgetful things. I didn't take any pictures because I was in a trance. Once we felt a little better, we decided to indulge in the actual palace tour, which turned out to be pretty unbelievable. I remember my dad saying how blown away he was, and it was truly extraordinary. I kind of wished we had done this first! One of the first things you see is the king's chapel, basically made for his own pleasure. I can only dream of that kind of self-indulgence. At the moment my biggest self-indulgence of the day is this iced coffee my husband brought me. We couldn't actually go inside, so the only way to see and get pictures was to lean over the railing and try and take it all in. You ready for the ceilings? It just all went crazy from that point on. It's hard to describe the level of jaw-dropping awe that was happening. After a while we just decided to leave the jaws open and drool openly on the floor. Of course, there's only so much you can capture with the limited rectangle of a camera click. I shall do my best to show you what we saw with the following gazillion pictures. (And yes, I forgave it for not being affixed by a big red flower bow). That chandelier, that faded ombre-style into a husky purple, led the way into the famous Hall of Mirrors. We definitely spent the most time in there, pretending like this was our party and all these people were here to celebrate our wealth. I joke around a lot but I just can't wrap my mind around what it would have been like to live there. They even had a special dinner table, where the king and queen could sit and eat while special guests just sat and watched them. It was a special honor to hear the king slurp his wine. For now, onward to the sleeping chambers! This next one was Marie Antoinette's room! Such an odd feeling to be standing there. Once we finished the tour and made our way back out of the gates of Versailles, we came back to the McDonald's and Starbucks area and decided to explore the rest of the town a little bit. We were beyond exhausted at this point, but we couldn't miss a chance to see some of the surrounding shops. We ended up wandering into a cheese shop (which in my opinion, every town should have). We bought some cheese and felt so successfully French. 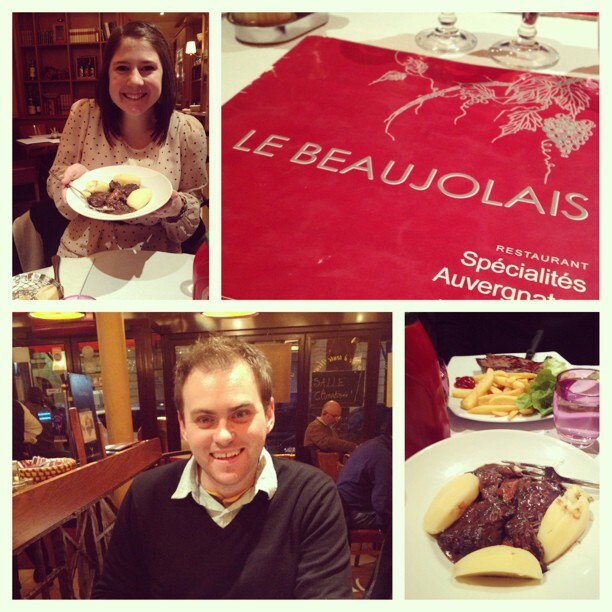 We took the train back into the heart of Paris, and got ready for a real French dinner. We were able to find a restaurant a few blocks down from the Eiffel Tower that had Beef Bourguignon, since that was high on my list for must-eats. It was so warm and cozy, and ended up being a good choice. It was pretty rainy that evening, so we slowly walked across the wet sidewalk back towards the stunning Lady Eiffel to get a last glimpse of it in the sparkling darkness. Before we knew it, we were being spontaneous. Just after the hourly sparkling stopped, we realized that the line to go to the top was really short. There was a big group of really obnoxious high school or young college kids, but other than that it was by far the shortest line we had seen the whole trip. The ride up was foggy and rainy, and by the time we got to the first level and those elevator doors opened, we almost regretted the decision entirely. Freezing cold wind and droplets of rain attacked us violently, and we had to make our way around to the line for the next elevator that would take us to the very top level! We huddled together and finally made it. Dusty had actually accidentally dropped our tickets in line on the ground, when he had pulled his gloves out of his pocket where he had put them. He was able to find one, soaking wet on the pavement, and luckily it said "ticket 1 of 2" on the flimsy corner. They were understanding, and thankfully let us through without any issue. We made it to the top terrace, burst through the blast of wind, and wound around to the back side where the wind and cold were less severe. The views were definitely stunning! It was really fun to see the city at night, as opposed to the evening/sunset that we were able to see from the top of the Arc de Triomphe. The top of the Arc will forever remain one of my top highlights of our trip, but I was glad we ended up taking the chance to go to the top of the Eiffel Tower as well. While we were up there, the clock struck 10pm and we were able to witness the sparkle from within! And although that group of kids was the absolute definition of loud Americans (a couple next to us in the elevator was completely outraged, glaring daggers and muttering "stupid Americans"), we were able to happily keep ourselves separated from that stereotype. We couldn't help heading back to the Arc one last time, to say goodbye, and to indulge in one last late-night dessert. We ended up being seated upstairs, which was perfect because we could see all the nightlife sparkling outside the windows. It was so warm and melt-in-my-seat fantastic. I didn't want to leave. Can't beat a steaming pot of thick chocolate drink. 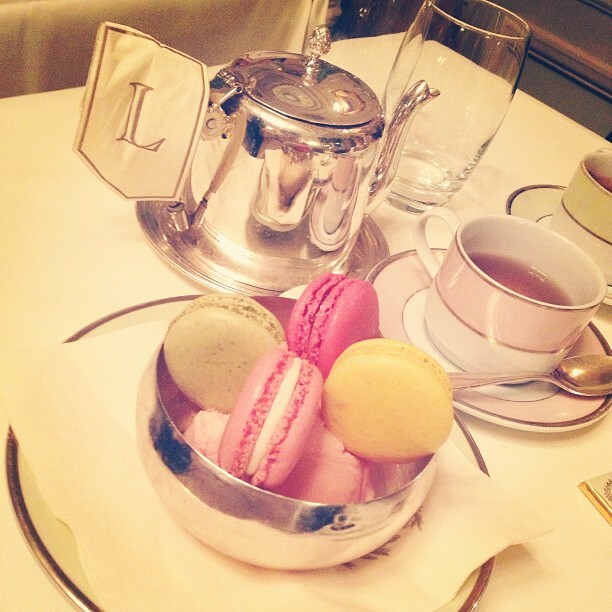 My dessert was rose petal ice cream, topped with rose, lemon, pistachio and raspberry macarons. Take me straight to heaven. Sadly, we realized on our way back to our apartment that our flight left much earlier than we thought. Like, 4 hours earlier. Instead of being able to sleep in a little and maybe even go out to breakfast, we had to wake up at dawn and lug our suitcases hurriedly out the door. It wasn't ideal, but our last evening in Paris was blissful, and the entire trip had been magical. I can't wait to go back to Paris one day - I know that I will. Hopefully more than once. This is the last photo I took! 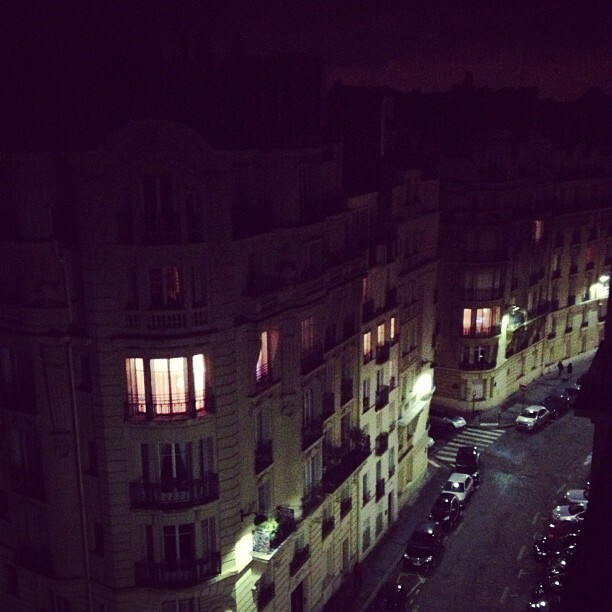 The view of our street, right before we called it a night and slept our last night away in Paris, France.